ολα ηταν υπεροχα το δωματιο παρα πολυ καλο κοντα στην εκκλησια και στο κεντρο μακαρι να καθομασταν κι αλλο. Studio bien placé, terrasse agréable, transferts assurés du ferry au logement. Bon accueil. La petite attention avec tous les matins le renouvellement pour le petit déjeuner. Εξυπηρετικο προσωπικο. Καθημερινη καθαριοτητα δωματιου. Πολυ καλη τοποθεσια. Ανετο δωματιο. L'albergo è vicinissimo al porto e l'albergatore ha mandato un van a prendermi. Posto centrale, tutti i servizi a pochi metri. La titolare gentilissima. Lock in a great price for Virginia Studios & Apartments – rated 8.5 by recent guests! Centrally located in Tinos Town, family-run Virginia Studios & Apartments is a few feet away from the famous church of the Virgin Mary and the port. It features self-catered accommodations with free Wi-Fi and a balcony or patio overlooking the garden. A kitchen or kitchenette including a fridge, dining area and electric kettle is included in all air-conditioned studios and apartments at the Virginia. Each unit has a TV, while some come equipped with a spa bath. 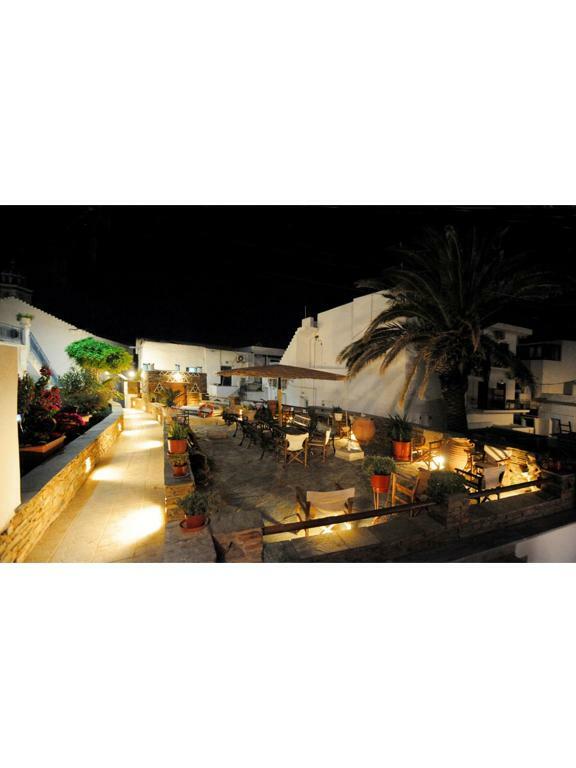 Traditional taverns, bars and shops are within a 5-minute walk from the property. Free 2-way transfer to Tinos Port is offered. The long, sandy beach of Agios Fokas is 2,650 feet from the property. Staff at the 24-hour front desk can arrange car rental. This is our guests' favorite part of Tinos, according to independent reviews. 뀐 Located in the top-rated area in Tinos, this property has an excellent location score of 9.3! When would you like to stay at Virginia Studios & Apartments? Air-conditioned apartment with a balcony or yard. Includes a kitchenette with cooker and hood with small dining area. Offers TV and Wi-Fi. Guests are provided with breakfast products. Air-conditioned studio with a balcony or yard. Includes a kitchenette with cooker and hood with small dining area, TV and Wi-Fi. Breakfast products are provided. Air-conditioned apartment with balcony. Includes two TVs, two fridges, free Wi-Fi and a private bathroom with spa bath. Breakfast products are provided. Είτε σχεδιάζετε μια σύντομη επίσκεψη και επιθυμείτε διαμονή κοντά στην περίφημη εκκλησία της Παναγίας, είτε προγραμματίζετε τις πολυήμερες διακοπές σας και αναζητάτε διαμονή στην Χώρα της Τήνου, επιλέξτε ένα από τα κεντρικότερα ξενοδοχεία, πλήρως εξοπλισμένα δωμάτια ή δίχωρα επιπλωμένα διαμερίσματα μέσα στη καρδιά της πόλης έχοντας άμεση πρόσβαση σε ότι χρειαστείτε. Πιστοί στις αρχές της αυθεντικής τηνιακής φιλοξενίας και ακολουθώντας μια οικογενειακή παράδοση από το 1965, διατηρούμε τη φιλοσοφία πως ο κάθε επισκέπτης μας, πρέπει φεύγοντας να νιώθει δικαιωμένος που μας έκανε την τιμή να εμπιστευθεί στα χέρια μας την διαμονή του, προσπαθώντας να του προσφέρουμε μια ευχάριστη εμπειρία και όχι να ακολουθούμε μια ψυχρή και απρόσωπη πελατειακή τακτική. House Rules Virginia Studios & Apartments takes special requests – add in the next step! Free! One child from 3 to 5 years stays free of charge when using existing beds. Virginia Studios &amp; Apartments accepts these cards and reserves the right to temporarily hold an amount prior to arrival. Virginia Studios & Apartments accepts these cards and reserves the right to temporarily hold an amount prior to arrival. Please inform Virginia Studios & Apartments of your expected arrival time in advance. You can use the Special Requests box when booking, or contact the property directly using the contact details in your confirmation.